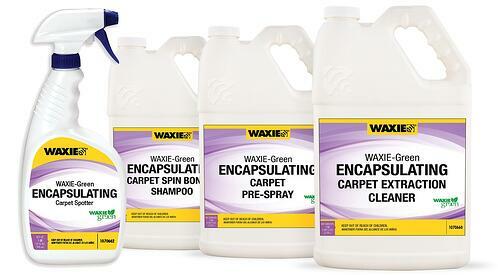 In addition to providing cleaning performance, the WAXIE-Green Encapsulating Carpet Care System is also formulated to reduce potential impacts on human health as well as the environment. WAXIE-Green products offer a compelling combination of performance, price, health and safety, along with an environmentally preferable profile. Traditional carpet chemicals are manufactured with ingredients that leave harmful sticky residues in the carpet. This residue builds up, while attracting soil to it. This leads to increased maintenance of the carpet, which impacts the bottom line cost of doing so. Encapsulation carpet chemicals are manufactured with ingredients that do not leave harmful sticky residues in the carpet. They also have a crystalline polymer included that is designed to trap and hold any remaining soil that is left behind in the cleaning process, and when the carpet dries, the crystalline and the soil is simply vacuumed away the next time the carpet is dry vacuumed. By not adding anything to the carpet, and removing what might be left behind as a result of the process of cleaning the carpet, the cost of maintaining carpets is dramatically reduced. Graph shows savings comparison between standard extraction chemicals being used, and encapsulation chemicals being used in 55,000 square foot area.